For some reason, I’ve been having a hard time getting this post up. Writer’s block? 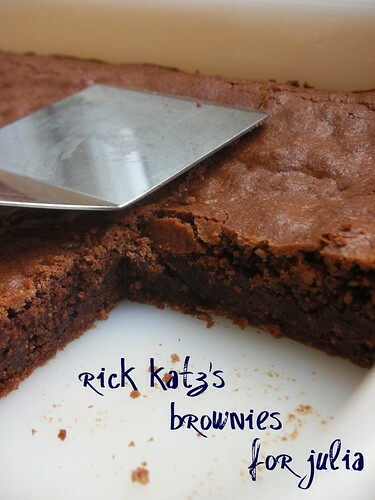 I dunno…maybe it’s just that these brownies, chosen by Chocolatechic Tanya for TWD, were too good for words! If you’ve made this recipe, or have even read through it, then you’ll have noticed something unusual…it requires a mixer to whip the heck out of the eggs and sugar! These are certainly fudgy brownies, but whereas the brownies I make at work are quite dense, you can feel what the whipped-in air does to these…they have a softer texutre and some chew. I read some reports of underbaked goo, so I baked my batch in a slightly larger pan than the recipe calls for, left them in the oven for a few extra insurance minutes and popped them in the fridge for half an hour before cutting into them. Perfect squares of deliciousness, with a paper-thin top crust. For the recipe, see Baking: From My Home to Yours by Dorie Greenspan, or read Chocolatechic. Don’t forget to check out the TWD Blogroll! Steph, Gotta give you props for baking all day at work and doing all of your baking at home! I also liked the results of whipping the sugar and eggs…that added step seems to make a wonderful difference in texture. By looking at your brownies texture, I’m sure we got the same thing… I kept it longer in the oven cause I had smaller mold. Turned out great, just like yours… just not as perfect looking, I guess and not my favorite. I like the kind you mention… dense and more chocolatey. I haven’t made these yet. I was a little turned off by all the people who thought they were just goo. I’ll have to try them tomorrow! These look perfect – what gives? 🙂 Mine were more on the gooey side – incredibly delicious though! No writing needed – the photo says volumes! Perfect brownies – truly! How wonderful ! I’d love one ! Mmmm…crumbly, fudgy but not overly dense brownies? I’m there! Yours do look great! I over-baked mine (by accident) and it turned out to be a good thing, based on all the comments about gooey centers. your brownies look amazing! It sounds like the bigger pan was definitely the way to go on these! Mine were quite gooey. Still delicious, but lots of gooo! They look perfect. I love the photo. Yours look a lot better than mine did, but the taste was out of this world! These are GOOD/Great brownies. And you pic says it all. Perfect. “Perfect squares of deliciousness” is a great way to describe these, they were so good! Yours look perfect. As an avid baker, it’s hard to admit that I’ve never actually made brownies from scratch. But this looks like the perfect recipe to try for my first time!! Thanks for sharing! Your brownies look perfectly scrumptious! I baked mine in a larger pan too after reading the P&Q comments. Well, Steph…. speaking of “those” brownies you make at that place you call “work,” are you not going to leak the place of your employ? he he You see you have sparked the curious. Ah well, I guess I will just have to rest in the fact that this brownie recipe is just the kind of “gooey-ness I like. hehe Your brownies look so delicious. I am really wanting some of these and mine are long gone. Off to the kitchen. You are amazing! Great shot of the brownies. Next time, I’m using a bigger pan, for sure! I love how yours turned out. I should have baked mine in a bigger pan. I am usually a fan of the chewy brownie – the one that you bake at work! – but this does look more dense than fudgy the way you have baked it. oh yum your brownie loks awesome! i made some a few weeks ago and while they werent so crash hot straight out of the oven, i left them in the kitchen totally forgot about them.. fast forward 4-5 days later i zapped a piece in the microwave and served with icecream- YUMMY!